Recently saw a post where someone stated emphatically, and incorrectly, that tire company ABC only covered their tires from date of a manufacture. So in an effort to set the record straight I decided to pull together some information. I am providing links and only a brief summary of the length of time a tire may be covered. As you see the time does vary and in many cases the clock doesn't start ticking until the date of sale BUT you will need to keep your proof or purchase. You may recall that in my post on The Best Tire, I suggested that one measure is the warranty. I strongly suggest you read the warranty information for your brand and type of tire. In some cases the coverage for a Light Truck Radial, LTR is different than a Truck Bus Radial, TBR. DO NOT use what I say here as the final say or as the complete statement of warranty. Upon examination by Bridgestone, before wearing down to 2/32 inch (1.6 mm) remaining original tread depth (i.e. worn down to the top of the built-in indicators in the original tread grooves) and within six years (seven years for certain tires, see the section entitled “Enhanced Casing Limited Warranty”) from the date of tire manufacture, any eligible tire that becomes unusable for any reason (see exclusions in the section entitled What This Limited Warranty Does Not Cover”) within the manufacturer’s control will either be repaired or replaced with an equivalent new Bridgestone brand truck tire on the basis set forth in this Limited Warranty. occurs first. At that time, all warranties, expressed or implied, expire." "5 years from the date of purchase—proof of purchase date required, or (b) 6 years from the date of tire manufacture without proof of purchase date"
"Worn to 2/32” (1.6mm) or more than 72 months old (based on date of purchase) whichever comes first. Proof of purchase is required. Without proof of purchase the manufacturer date will be used to determine eligibility." If before wearing down to 2/32nds of an inch of original tread depth (i.e., worn down to the top of the built-in indicators in the tread grooves) or 6-years from the date of manufacture (referenced by the last three or four digits of the DOT number), whichever occurs first, an examination by Firestone shows that any tire covered by this warranty has become unusable for any reason within the manufacturer’s control, such tire will either be repaired at no charge or replaced with an equivalent new Firestone tire on the basis set forth below...."
"3 years from the date of purchase – proof of purchase date required, or (b) 4 years from the date of tire manufacture without proof of purchase date. " "The new tire coverage of this warranty ends when the treadwear indicators become visible or five (5) years from the date of purchase, whichever occurs first. The only exception is weather cracking, which carries a seven (7) year warranty from the date of purchase or when the treadwear indicators become visible, whichever occurs first. Without proof of purchase, date of manufacture will be used to determine eligibility." "6 years from the date of original tire manufacture, or new tire purchase date (whichever comes first). (Without proof of purchase, the date of manufacture will be used to determine eligibility.) "
"MICHELIN® truck tires bearing the MICHELIN® name and complete serial and identification numbers, used in consumer service, such as on a motorhome, according to the instructions contained in this Operator’s Manual, are covered by this limited warranty against defects in workmanship and materials for the life of the original tread or five years from the date of purchase, whichever comes first"
"If there is a defect in workmanship and materials during the life of the original usable tread, or six years from date of purchase (whichever comes first), a replacement"
I provided some links. Use them and read the contract. It is your responsibility to get clarification from your tire dealer. HI, my name is Gene De Lash. and the Question I musts ask is,about tire gauges.I have 8 different tire gauges.digital, the ones that have a round dial type ,the stander type , and one that connects to the air hose I have paid any were form free to 65.00 and believe it or not I can not get two of the gauges to read the same I get a reading anywhere from 2 to 6 lbs differences between all the gauges . 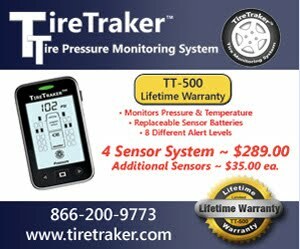 I also have pressure Pro tire monitoring system and that is what I use mostly. However is there a tire gauge that is accurate and works. I just had to have all my tires on my 5th Wheel replaces and I requested the tire company but 125 lbs in each tire, when using my pressure pro system to check the tire pressure 118 lbs in each tire but yet the dealers gauge tire read 125 lbs.7 lbs differences. I would like to know is there a gauge that really works if so please let me know. Beware of dealers who say, "You have to apply for the warranty from the company. We only replace them and and you pay us. It is up to you to apply for any adjustments." I have run into this little problem, which because the Tire Company was sympathetic, remained small. I called the company while the tire was being replaced and was actually able to get in touch with a real person. It just so happened the company rep was in the area and much to the dealer's surprise he "showed up." The dealer got a course in the warranty policy of the manufacturer and I got my replacement, plus a $50 check for my inconvenience. Thanks for the article and information. It will more than likely help some poor guy, like me.